Grave Concoctions is a store in Falkreath specializing in alchemy and home for Zaria who runs the store. It is found between Lod's House and Falkreath Barracks, opposite the Jarl's Longhouse. There is a wooden bench in front of the house and a patch of fly amanita mushroom growing to the right. It is difficult entering with stealth due to a guard being posted opposite outside the Jarl's Longhouse. The store is run by Zaria, a Redguard immigrant that moved to Falkreath to explore her love of poisons. 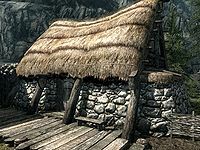 The store's name honors the large cemetery - a tradition shared by many of the businesses in Falkreath, such as Corpselight Farm and Dead Man's Drink - although she always comments on the name, showing concern that it might put you off. Upon entering, the counter is immediately on your left, on which there is a bottle of alto wine, a bottle of wine, a large coin purse and several potions that can be bought or stolen, while under the counter is a copy of On the Great Collapse and a giant's toe. 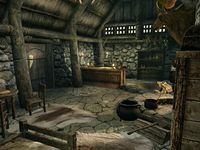 Behind the counter in the southwestern corner of the building is an alchemy lab and food barrel, which is where Zaria normally spends her time making poisons and potions. Beside the lab is a basket containing a sample of fly amanita and, against the east wall, a cupboard holding several potions and ingredients that she sells, along with a gourd. Hanging from the ceiling above the cupboard are two garlic braids, a bunch of elves ear and a bunch of frost mirriam. Opposite the door is a fireplace, with several barrels containing ingredients to the left. On the hearth is a woodcutter's axe and on the mantelpiece there are a few poisons and potions on display. To the right of the fire is another cupboard, above this are three more bunches of elves ear and two more of frost mirriam. The cupboard only holds clutter. To the right of the cupboard obscured by baskets is a copy of the Alchemy skill book De Rerum Dirennis. Coming out from the middle of the west wall is an owned single bed, with an end table to the left and a dresser to the right. On the end table is a bottle each of wine and alto wine, while on the dresser is a steel mace. To the right against the north wall is an unlocked chest containing minor loot. To the right of this is a round wooden table and two chairs, holding a bottle of wine on one and a bottle of wine and a loaf of bread on the other. The following items are sitting out in the store, on counters and the like. They can be purchased from the merchant or stolen. Other items may also be present in the store, but those other items are not available for purchase. They respawn after ten days. This is the merchandise found in Grave Concoction's Merchant Chest. These items are only available if purchased from the merchant; they cannot be pickpocketed or stolen. They are restocked every two days. This page was last modified on 10 July 2017, at 20:14.